Motorola Moto G 3rd gen 2015 is the upcoming smartphone from the Motorola. 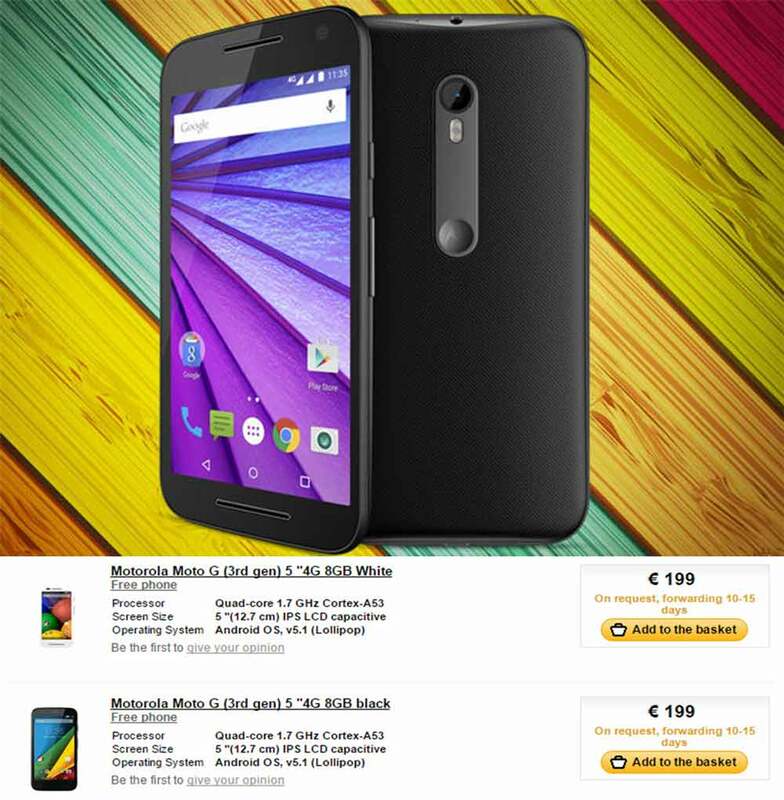 The complete specifications of the next MOTO G 3rd generation have been leaked and listed on Spanish retail site. The listing reveals, the phone will come in several variants including 1GB RAM with .2GHz quad core Snapdragon 410 CPU and 2GB RAM with 1.7GHz quad core 64bit Qualcomm Snapdragon 610 processor. The Motorola Moto G 3rd gen will have dual SIM support with 4G LTE connectivity. If the source is to be believed, the upcoming Moto G 2015 Edition will have 5 inch display with 1280 x 720 pixels resolution. This time it can record full HD 1080p videos. It would compete with YU Yureka Plus, Yu Yuphoria, Asus Zenfone 2, Moto E, LG Volt, iPhone 4s, Coolpad Dazen 1, Xiaomi Redmi Note 4g, Xiaomi Mi-4i, BLUE Studio Energy , MMX canvas spark, Samsung Galaxy S3 / S4 and HTC desire 610. The phone will run on Android 5.1.1 Lollipop. With the new Moto G 3 rd generation, you will be able to take better pictures, thanks to the 13MP primary camera with LED flash and 5MP secondary shooter. To make the phone alive, there will be 2470 mAh battery. It will have micro SD card slot for further memory expansion up to 128GB via the microSD card. The Release date of Motorola Moto G 3rd gen is expected to July 28th 2015. The pricing of the phone would be under RS 15000 in India, $ 230 in USA /Canada or €200 in UK / Europe.